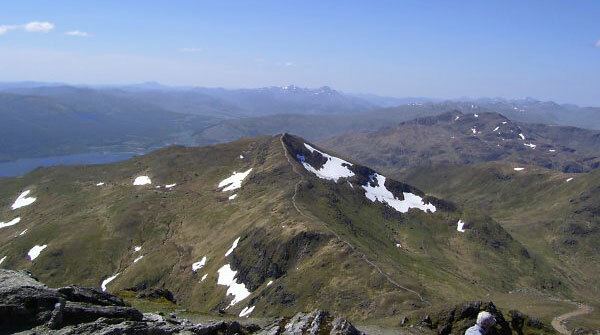 Beinn Ghlas is an easy mountain to climb with slopes primarily of grass with some rocky outcrops, although the northern slopes are craggy and should be avoided. 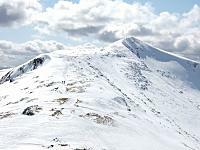 Due to its proximity to The National Trust Visitor Centre and Nature Trail, Beinn Ghlas is also one of Britain's most frequently climbed mountains, as testified by the broad eroded path up its SW ridge. 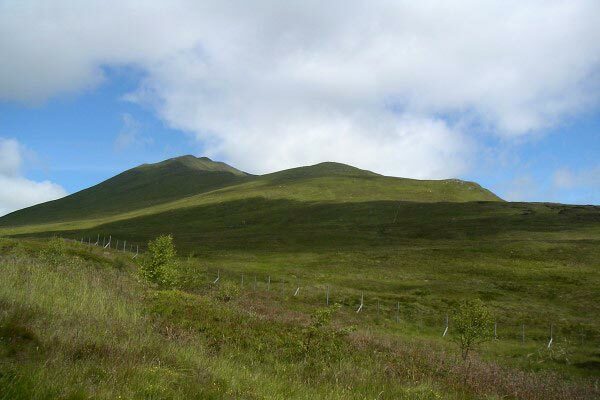 There is an alternative descent from the col between Ben Lawers and Beinn Ghlas on the N slopes of Beinn Ghlas which leads to the bealach at the head of Coire Odhar then on an old drove road to join the original path down the Nature Trail to the car park. Beinn Ghlas from Lawers car park 31st may 2008. This was taking at the end of the walk, certainly wasn't this sunny at the start! 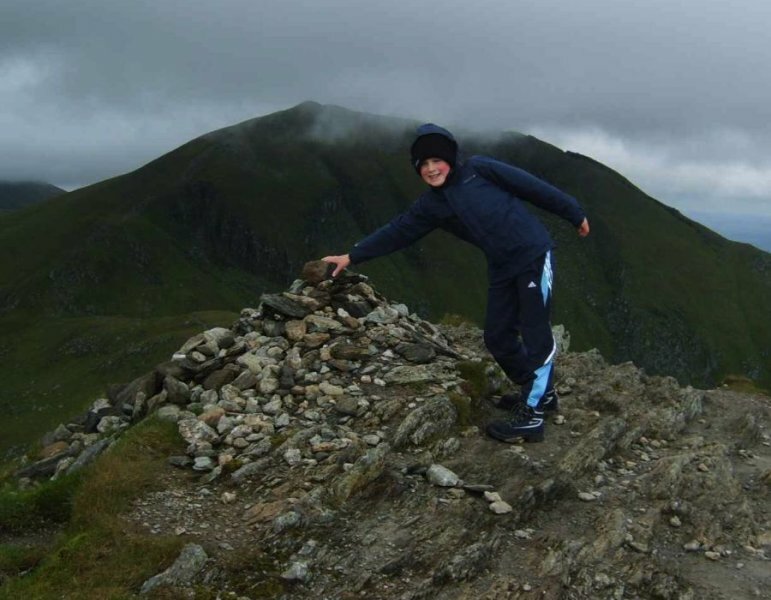 The summary information of one or more ascent routes that include Beinn Ghlas. Nathan's fourth - that's both weans done this one now! Post a few words about Beinn Ghlas or read what others have had to say. This may be an easy mountain due to its high start point from the upper car park.Don`t be fooled in Icy conditions though.It changes in to a real challenge when the slopes are solid ice as they were today.Full mountain Winter kit is needed under these conditions or you are in for a treacherous time.Came up against several folk who were forced back due to no ice axe/crampons etc.Pulled a calf muscle after collapsing in to deep snow.White out on the way down.Happy days. Set off at 7 pm and joggged up in just under an hour. Took 25 minutes to get down running at a fair pace. I'd missed this when doing the Lawers ridges walk a couple of years back so it was on my to do list when passing the area. Last walk of a busy couple of days. 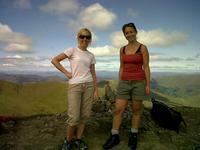 Great view of Lawers. The sun beginning to set creating a soft crimson sky, and a rainbow shimmering over Loch Tay, made this a very picturesque evening walk. Climbed on 20/07/08- took the path from the Visitor's Centre car park to the summit. A day with a cold biting wind and passing showers making the climb slightly more difficult than it should have been. "Ben Lawers seen from Beinn Ghlas" is one of the few photos that is not deceptive - they really are that close! Thought this one was going to be really easy....quick lesson learned...no mountain is easy when the weather turns. Had intended to continue onto Lawers but made the decision to turn back after peaking Ghlas. The wind was raging and it whipped up white out conditions very rapidly. The bothy bag was used for the first time, which gave us a much needed rest from the constant buffeting. Hard to keep our feet on the ground! There are a couple of nice flat plateau's near the top that rested your legs for a while. Satisfying day made interesting by the conditions. 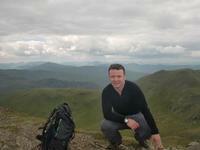 As part of an attempted round trip of Ghlas, Lawers, An Stuc, Meall Garbh and Meall Greigh. A fairly easy climb, though very poor visibility. Summited in about 1'45.